Ecoluxe London will be talking sustainability in Peru Moda from the 25th-27th April, 2018. Lima Convention Center. Our 'Tough Fashion' exhibition has travelled to Greece and is presented in Athens from 9-28 February 2018. EcoluxeLondon will not exhibit during London Fashion Week Feb 2018. Despite 15 successful season the shrinking of LFW and Brexit uncertainty mean EcoluxeLondon must focus on different sales approaches and listen to the winds of change. 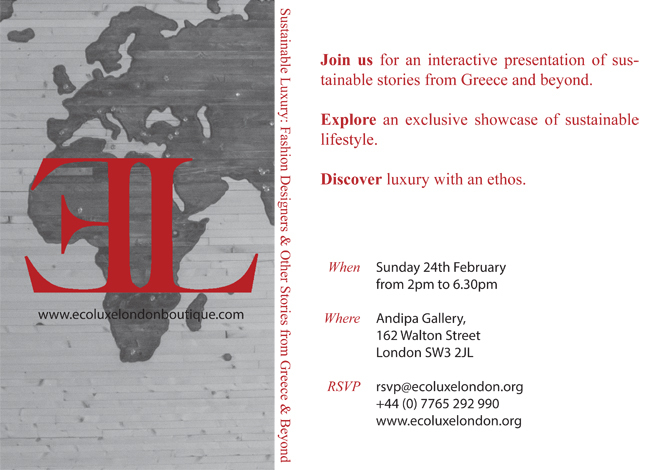 Join us for an interactive presentation of sustainable stories from Greece and beyond. Explore an exclusive showcase of sustainable lifestyle. Discover luxury with an ethos. Ecoluxe London has been an independent film producer since 2013. Ecoluxe London has been an independent film producer since 2013. EL Productions, first short film ‘Four Dark Stories’ won the audience award in the International Drama FIlm Festival. Since then, we are working towards our first feature film, which will be in cinemas in 2018. We are always interested in collaborations and interesting projects as we have our own equipment and dedicated team that we work with. 2018: Feature film Mirsini is not alone: a film against drugs, homophobia, domestic violence. Documentaries: Where nymphs live: a documentary about unknown waterfalls of Greece Agave embroidery of Kefallonia island: documenting for the first time the history of the fine embroidery made of agave threads on Kefallonia island of Greece. Ecoluxe London, was launched on the weekend of 18 th-19th September 2010. Created by designers Stamo and Elena Garcia.. Devotion to luxurious eco-sustainable fashion is the raison d'etre of Ecoluxe London. Pioneers in our industry, a claim that only select few can genuinely make, we have unwaveringly upheld our values since our inception. We are a not-for-profit organisation promoting and supporting ecological and sustainable luxury fashion. We partner with charities, organisations, social enterprises, other non-profit entities, corporations and the media. We work strictly with eco-conscious brands and designers who utilise ecologically sustainable practices, thus conforming to the environmental, economic and social dimensions of sustainability both for menswear & womenwear. We believe that teamwork is what makes ecoluxe London works. Combining and sharing the same values based on ethos and creating luxury products with ecological consciousness,make this exhibition come true. Your opinion matters to us. Feel free to send as your questions or comments. Soon we will provide you with an answer.